Bahrain says a newly-discovered oil field contains up to 80bn barrels of tight (or shale) oil, dwarfing the Gulf island kingdom’s current reserves. Appraisals of the offshore Khaleej Al Bahrain basin by two US firms also suggest the presence of 280bn to 560bn cubic metres of natural gas. Oil Minister Sheikh Mohammed bin Khalifa Al Khalifa said it was not yet known how much oil could be extracted. But it could turn Bahrain into a major player in the global market. Before the discovery, Bahrain had proven crude reserves of just 125m barrels and 92bn cubic metres of natural gas. By comparison, neighbouring Saudi Arabia, the world’s top oil exporter, has 266bn barrels of proven reserves. Qatar, the top exporter of liquefied natural gas, has 24tn cubic metres of gas. Sheikh Mohammed told a news conference in Manama on Wednesday that Bahrain’s National Oil and Gas Authority aimed to attract foreign oil and gas firms to develop the Khaleej Al Bahrain field, which covers 2,000sq km. An agreement had already been reached with Halliburton to drill two further appraisal wells this year to “further evaluate reservoir potential, optimise completions, and initiate long-term production”, he said. 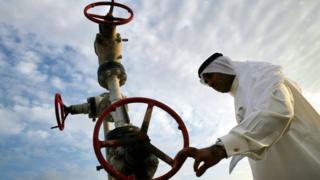 Bahrain currently produces about 50,000 barrels of oil per day from the Bahrain Field, which was discovered in 1932. It also gets another 150,000 barrels per day from the Abu Saafa field, which it shares with Saudi Arabia.